As those efforts continue, SFWMD Chief Engineer John Mitnik gave a weekly video update about the latest feature being utilized by SFWMD to combat high water. By accelerating the operations of the recently completed Lakeside Ranch Stormwater Treatment Area (STA), water managers are taking water directly from Lake Okeechobee to reduce the need for estuary releases. Additionally, the STA is capturing local basin runoff that would have made its way into the lake. The update can be seen by clicking HERE or visiting the District's website dedicated to the emergency situation at www.sfwmd.gov/managinghighwater. 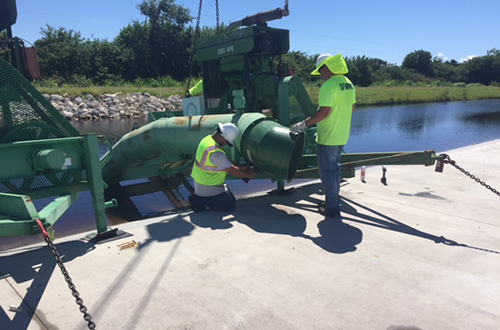 In order to move water from Lake Okeechobee into the STA, SFWMD is using temporary pumps. As part of the filling process, approximately 2,600 acre-feet, or about 840 million gallons of water, will be pumped from Lake Okeechobee and the local basins into the STA. This will aid in relief to coastal estuaries and improve water quality in the lake. The video explains how SFWMD has substantially completed both phases of the 2,700-acre STA adjacent to the lake. The STA will now be filled with water for operational testing and to help grow the plants that will clean nutrients from local runoff in the Taylor Creek and Nubbins Slough basins. These basins, flowing into Lake Okeechobee, rank among the highest nutrient contributions to the lake each year. SFWMD Chief Engineer John Mitnik provides an update on District actions to continue to move water throughout South Florida, including deploying temporary pumps at the recently completed south Lakeside Ranch Stormwater Treatment Area along the northeastern shore of Lake Okeechobee.